What do you get when you mix a crazy bunch of runners, beer, red dresses, and the Zebra Child Protection Centre? A fun filled afternoon to raise money for a worthwhile organization in Edmonton. 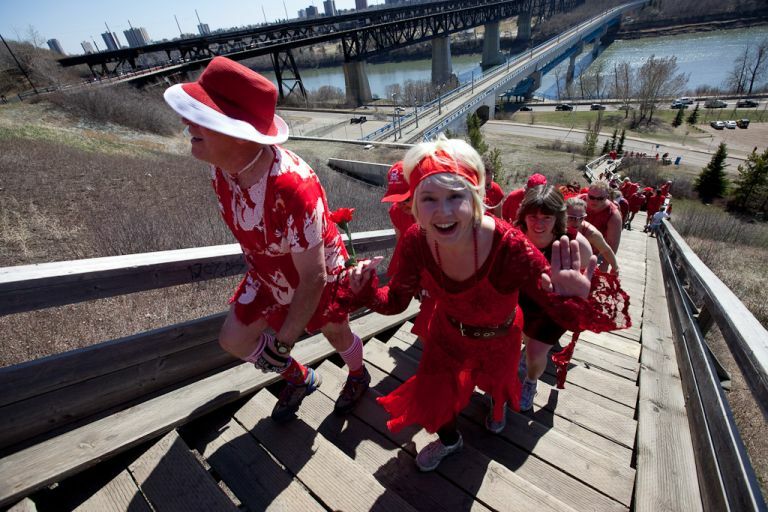 This past Saturday I was asked to photograph the annual Red Dress Run for the Edmonton Chapter of the Hash House Harriers. For the uninitiated, the Hashers are a worldwide organization of drinkers afflicted with a running problem. 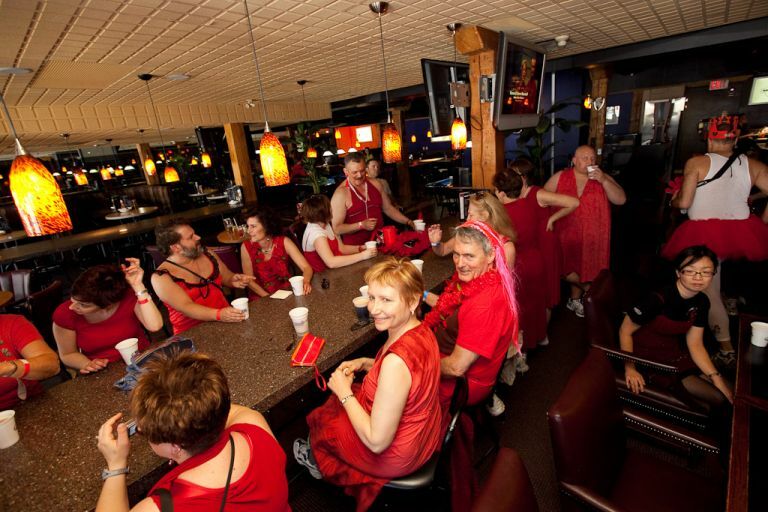 Each year they hold a special event called the Red Dress Run in support of a local charity. 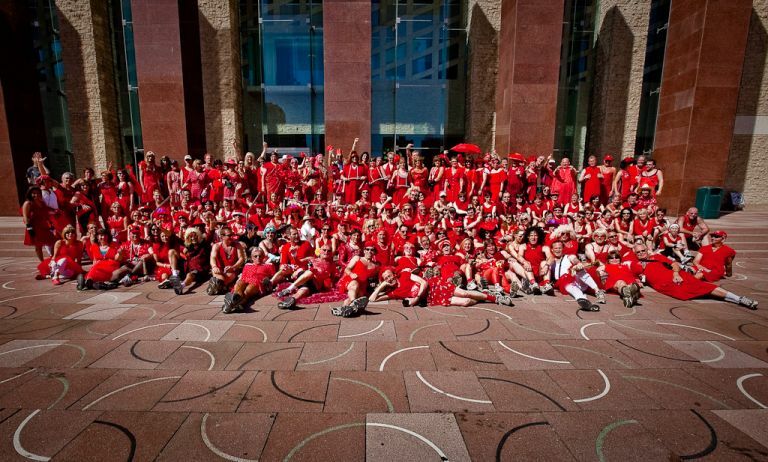 Around 200 men and women from Edmonton and beyond, come dressed in Red Dresses and take to the streets of Edmonton. The group made up of walkers and runners make their way along a marked route throughout the city with stops along the way at local watering holes (called Hasholds) for a quick refreshment before moving on to the next destination. Along the way, runners will also solicit donations from the unfortunate souls who find themselves suddenly surrounded by a group of men and women in short skirts, feather boas, garters, and tutus. After the run, the group meets back up for a dinner, dance and charity auction to cap off the day’s event. Each year the group selects a different charity to support. This year’s charity was the Zebra Child Protection Centre. – The centre;Â the first of it’s kind in Canada, is located in Edmonton and it’sÂ purpose is to provide care to abused children. According to their website. “The centre integrates a multi-disciplinary community of professionals — Edmonton Police Service, Alberta Childrenâ€™s Services, Crown Prosecutors, Child at Risk Response Teams, medical and trauma screening professionals and volunteer advocates — in a child centred environment that nurtures the abused child and uses all the wisdom of its partnership to see that justice is done.” While it is unfortunate that we need such a place in the city it is great to know that organizations such as this exist to help those in need. I had a great time covering the event and want to thank the Hashers for inviting me to join them on their run. I always enjoy the opportunity to give back to the community and help out a great local cause. If you’d like to learn more about the Edmonton Hash House Harriers – visit their website at http://www.edmontonhasher.com. Here are a few photos from the day’s event. Nice to have them taken by a professional. Particularly like the one with the Hashers coming up the stairs with the two bridges in the background. That would be a neat poster or painting with the linear details from the bridges and stairs.